Lisa Haneberg is a great friend who is an expert (and a lifelong student) on the craft of management. I have been following her blog and her work since last six years and she has greatly influenced my own blogging journey so far. Lisa is an expert in the areas of organization development, management, leadership, talent management, and personal and organizational success. With over 25 years of rich experience in providing departmental leadership, consulting, training and coaching solutions for manufacturing, health care, high technology, government, and nonprofit organizations, Lisa has written 13 business books and speaks on a broad range of topics of interest to leaders and managers. 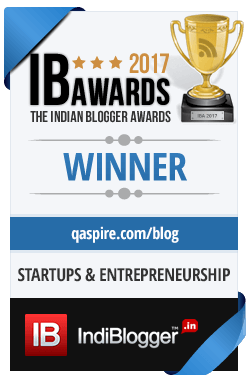 [Tanmay] Lisa, I have enjoyed your blog since many years and I am so glad you have compiled a book with “best from Management Craft” posts. Tell us a little bit about your blogging journey so far and how blogging helped you evolve. [Lisa] I started blogging in August of 2004 and I had no idea what I was doing or what great blogs looked like. I became a blog reader and a blog writer at the same time. I don’t recommend this! My learning curve was steep and I had to learn a lot of lessons. Eight years later I can say that blogging has helped me develop a unique voice and greater authenticity. When I write books, the publisher often wants a fairly formal treatment of a topic. But the blog is informal and therefore more me. So my blog helped me find the real me. [Tanmay] At QAspire, I write on the “human” aspect of leading others for excellence. I loved the post where you say that all of us are “beautifully flawed persons”. What according to you makes these flaws beautiful? [Lisa] I think that flaws are beautiful when we get things done in spite of them. The leader who builds a great team even though he is shy.The manager that struggles against her defensiveness to be more inclusive. Our most interesting qualities are usually productive flaws. And I think we are beautiful when we work well with people regardless of their flaws or ours. [Tanmay] How do you see the role of manager evolving in a knowledge-intensive world where teams are distributed across the globe? [Lisa] I think we need to be better at showing the love. Really. As our ways of working become more physically detached, I think we need to try extra hard to create connection and build ownership. Managers need to become expert connectors and they need to learn to show warmth, care, and support through the phone, email, IM, and social networks. Not easy! – not a set of tasks to do. We help people do their best work. [Tanmay] How was your experience curating and editing “The ASTD Management Development Handbook”? Any lessons from that journey that you would like to share? [Lisa] I was honored to be asked to select and work with a collection of nearly 40 authors. The best part was finding and inviting people. The toughest part was keeping them all in the loop. If I were doing it over, I would have done a better job with communication. Perhaps I need to apply my own advice from the previous question. [Tanmay] If there was one key message from “Never-Ending New Beginnings” that you had to share with today’s manager, what would that be? [Lisa] That we will enjoy a better career and impact more people if we constantly reinvent ourselves. Always look inside yourself first to discover the path to catalyze breakthroughs in organizations. That is why the name of the book is what it is – there is no single post with this title, but it is the central idea. Never stop reinventing. [Tanmay] Thank you Lisa, for your thoughtful responses. Thank you also for inspiring me at various points in my blogging journey so far. I am pretty sure readers of this blog would find your blog/books useful and inspiring. [Lisa] Tanmay – thank you so much. I have enjoyed reading your work, admire your thinking, and look forward to seeing what you do next!